DO YOU KNOW WHAT’S IN YOUR COUGH REMEDY? Chances are you can’t pronounce half the ingredients listed on the package (and we can’t either)! That’s why it’s time to trust the natural power of HoneyWorks™. 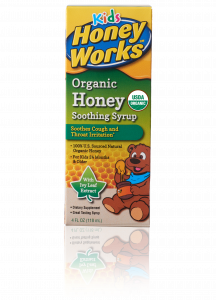 This great-tasting product offers fast and effective cough relief and it’s made with 100% U.S. sourced, natural, USDA certified-organic dark honey. Honey is an antioxidant that has been used by cultures all around the world over the past 2,500 years for a variety of health reasons including coughs, and sore throats.